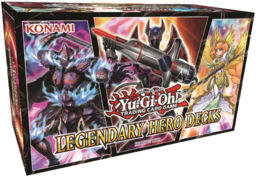 Legendary Hero Decks is a TCG-exclusive set that contains 3 pre-constructed Decks, and is the fourth set in the Legendary Decks series. This was originally scheduled to be released October 5, 2018, but was delayed due to October 18 due to Hurricane Florence affecting North and South Carolina. ↑ "The Organization | [TCG] Legendary Hero Decks". YGOrganization. June 15, 2018. Retrieved September 27, 2018. ↑ "The Organization | [TCG] Regarding the Legendary Hero Decks being Delayed". YGOrganization. September 27, 2018. Retrieved September 27, 2018.